I read this article and found it very interesting, thought it might be something for you. The article is called HUMAN’s Micro Markets Land on Entrepreneur Magazine’s Innovation List and is located at http://www.healthyvending.com/blog/humans-micro-markets-rank-entrepreneur-magazines-15-innovative-established-franchises-list/. 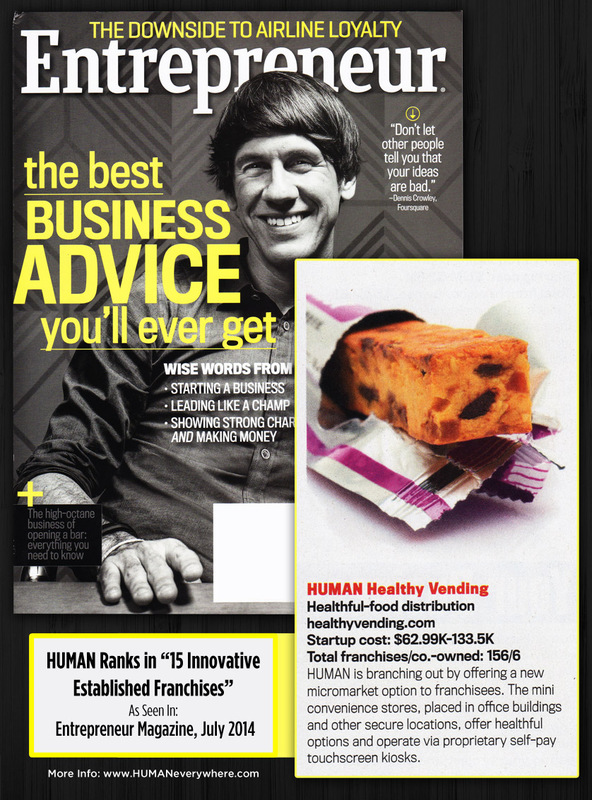 Entrepreneur Magazine has named HUMAN in its “15 Innovative Established Franchises” list citing our expansion into healthy micro markets as our key new innovation. 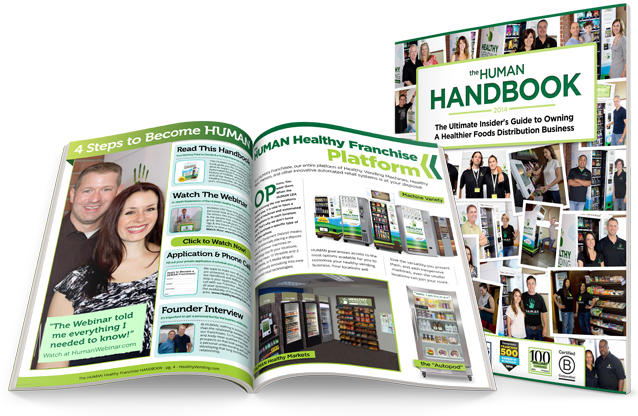 Ranked amongst some of the nation’s most established and profitable franchises, like McDonald’s, Taco Bell, the UPS Store and 7-11, HUMAN stands alone as the only automated retail and health-focused franchise on the list. Micro markets, also spelled “micro-markets” and “micromarkets,” are free-standing, self-serve, unstaffed and cashless convenience stores customized to fit any office space. They’re the latest advancement in the automated retail, vending and foodservice industries and the largest opportunity for locations that want to offer a health & company-culture-boosting perk. They’re also a huge opportunity for HUMAN franchisees who want to diversify their services. In 2012, 31% of vending operators expanded into new services with nearly 58% of those expanding into micro markets (State of the Vending Industry 2013). Micro markets typically have higher sales volume than vending machines. Micro markets make an average of $4,113 per month, with the largest location generating $26,526 per month. Compare that to vending machines, which average $305.04 in sales per month. Fresh food sales in micro markets account for 30% of the sales, which are a missed opportunity in most vending machines. The industry is $90M and is expected to be $1.6B in ten years. Micro markets are the next big opportunity in the vending industry. There are close to 100k businesses in the US with more than 150 employees, which means there is a huge demographic that would benefit from micro markets (source: US Bureau of Labor Statistics’ 2011 census data). Market research firm IRI found that 49 percent of the population has one to two snacks a day while 43 percent have three to four, and 60 percent of consumers snack for enjoyment. Are you interested in learning more about micro markets? For information on having an innovative healthy micro market, healthy vending machine, or snack delivery service at your location, please click here. To read Entrepreneur Magazine’s full list of Innovative Franchises, please purchase their July 2014 issue, on stands now.